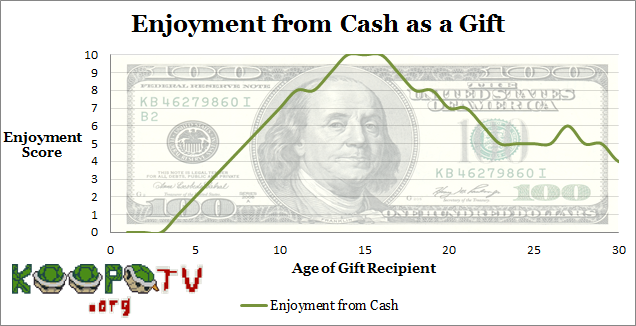 This chart displays how much enjoyment a gift recipient gets from receiving cash as a gift. The youngest children wouldn't enjoy cash, since they don't understand the concept of money. The sooner you teach them what currency is, the sooner you can start giving them money as a gift. As long as your kid won't make a mess of things and create agony among the population, bring them to the grocery store or even to the Nintendo Store. Not only do you want to show off that capitalism is fantastic at filling the shelves with products that people want, but that this amazing invention called money can be used to acquire these products, them products, those products, and products you haven't even heard of. Only start teaching them about this once they grow out of the “I need to put everything in my mouth” phase of development, though, since cash is filled with gross germs. Soon, young kids will be clamouring for cash to impulsively buy goods such as the candy by the cash register. Kids don't really know how to save money or understand the real value of the dollar due to inexperience, so you can treat birthday money like a bonus (if you're giving them an allowance) cash infusion so they can pick a treat for themselves. You can get away with giving them much less in cash than you would having actually spent on a gift. Kids don't care about the thought behind a present. They just want something, and if they at least know what money is, they'll appreciate it. As kids grow up to be teenagers, they'll want independence. Besides a car (and they may be too young to be permitted to drive), they'll want money. However, they're too young to have a stable income. It's the classic teenage paradox: They're dependent on their parents, while trying to brag about independence. Cash is the most thoughtful gift you can give to a teenager, because it maximises their independence — they can control exactly how to spend it. You're giving them control over their lives as a gift, which is what they want. If they give you any crap about the thoughtfulness of the gift, they're just trying to guilt-trip you to extract more, since teenagers are crafty critters. They secretly enjoy cash — it's the peak of when cash is the most appreciated. If you think the teenager might spend it on drugs or something by the school parking lot, buy them Amazon gift cards instead. (More on gift cards later.) They'll have to take some extra steps to convert those to drugs, and most teenagers are lazy and too dumb to barter. After that, teenagers might go to college, where they always will appreciate cash just to live. That barely-scraping-by lifestyle continues for many young adults as they need cash to make the next rent payment, or pay for that traffic ticket, or whatever. Cash is always appreciated. By this age, the cash requirements of a young adult may be quite a bit more than how much you could get away with buying a material object. The worst gift you can get people is food, especially perishable food. You're basically time-limiting the amount of impact you can have on someone's life. They eat the food, and then what? They forget. Food is fleeting. You don't help anyone with food. What if the food tastes bad or they're allergic to it? You don't give anyone a special feeling with food. Don't get food. Also, don't buy people gift cards, unless they're Amazon gift cards or prepaid Mastercard/Visa cards. Amazon gift cards are basically cash equivalents, except there aren't drug dealers on Amazon. KoopaTV's very own Loyalty Rewards Program uses Amazon gift cards when we're feeling generous, which we certainly are for the Loyalty Rewards Program round ending at the end of this month (December 2017)! Cash, by the way, doesn't exclude you from the digital economy — you can easily purchase things like Visa prepaid cards with cash that you can then use like any debit or credit card online. What's the best free gift to give someone? Direct them towards this very website, www.KoopaTV.org. We have new content every weekday, and a massive, FREE treasure trove of well over a thousand quality articles that are time-tested to be informative and entertaining. You can literally be submerged in KoopaTV goodness for hours and hours at a time. Best gift you can give someone, believe me. Ludwig is a miser and hoards his money, so he doesn't actually give any gifts to anyone. Fortunately, you're probably a lot more generous than he is. If you wish to be generous to KoopaTV, the site does not accept cash, but does accept digital trading methods that it can then give out to other people, such as those Amazon codes. You could consider that generous, at least. KoopaTV also generously offers its content for free, including its own in-house, original videogames. You should find a new, free browser-based videogame published on KoopaTV very soon. Ludwig has spent a lot of time interviewing teenagers in general, most recently those who have been victims of sexual misconduct by Roy, so there is some basis for this article. You might also want to avoid giving people sweaters or socks as a gift. Thanks to the tax cut, you can have more cash to give to others! Hey, here's that new, free browser-based videogame published on KoopaTV, one day after this! It seems every year I have to think more about what I specifically want for Christmas or my birthday. So I believe just getting money is fine, since I can save it and use it for something like a Switch. One thing I didn't mention in this article is what you said: Unlike any other gift, you can use money and SAVE it to get something for later. Are the holidays an inconvenient time for you to get free stuff? (Such as, perhaps, having a birthday at the same time...) Well, unless you wait too long (dat inflation), cash can be used for delayed gratification for a better time. Games with ingame money is probably a great educational tool for younger audiences such as Animal Crossing, Pokemon or Splatoon. They need to do some sort of job in order to get the money such as hitting money rocks in Animal Crossing, grinding in the Elite Four or Turf Wars depending on game and see that some items ingame are more expensive than others. The in-game economies for those, especially Pokémon, are totally screwed up, like the Kanto bike shop. Other than that, you never need to grind to afford things since everything is so cheap and money is so plentiful! Grinding for the exact chunks you want in Splatoon 2 can be very time consuming showing that sometimes for things like pure gear you need to spend a lot of time. They even raised the level up requirement for the Splatfest tees so one won't just grind and scrub the first sub each time anymore. Money is the most boring present in the world. If you want to embarrass yourself as being entirely uncreative or unwilling to spend any thought on a present, then go for money as a present. But keep in mind: if everybody would just gift money, Christmas regresses into some random bank transfer, that's approximately as fun as filling out a tax form. The best present is something, which the other person wants, but does not know that they want it yet. I see nothing wrong with invoking Boring, but Practical. From my limited understanding, Christmas isn't supposed to be fun. It's supposed to be something about Jesus and be joyous. But people kind of already do that since it's pretty easy to go to the Internet and see how much your gift cost, unless it was a home-made gift. I'll probably get some cash, a few gift cards, and clothes in the next couple of days. However, the best gift that I will receive this year is one that cannot be opened. This gift had a lot of time and effort placed into it to make it something rather special. Out of everything else, it stands apart in that it cannot be traded in and it does not devalue over time. I'm talking about the newest KoopaTV game, of course. ...Damn, well, I hope we can meet your expectations. Cash not only works as a gift, but as appetizers as well! I'm certain you've heard of a Mexican festivity known as piñatas. Well, our family celebrates the days leading up to Christmas by doing the rosary with their communities, and banging a stick against some wooden representation of a creature, stuffed with fats commonly associated with the common name, candy. A brilliant family had the idea of putting ten dollars in the first piñata, and a twenty dollar bill in the second. Let's just say engagement was through the roof. I didn't get the grand prize, but I got two dollars overall! That should be enough to get me some candy at the dollar store. Yeah, I know about it thanks to Viva Piñata! Appetiser, eh? It sounds like you ate the cash. Article: "Only start teaching them about this once they grow out of the “I need to put everything in my mouth” phase of development, though, since cash is filled with gross germs." Since engagement was through the roof, I'd say that proves that everyone likes cash.